The life of a transcriber is one that resonates between the bedroom and in front of a computer with headsets over your head most of the time. It can be consuming and flat out frustrating if you do not have the best headphones for transcription. For instance. You are transcribing a two-hour long interview with four subjects and they have an accent. That is not the problem though. The problem is that, the voices are so muffled up that you wonder if the subjects had a piece of polythene in their mouth. You are straining so hard that you end up with ringing ears and a headache to boot. Transcription headphones are made to make your life easier. They are designed to pick out the vocal range and cancel out all the other unnecessary background noise. This effect makes them an excellent piece of technology a transcriber cannot afford not to have. Evidently, many brands of headphones exist in the market. However, not all the headphones are created equal. Different manufacturers design and align the technology of their pieces to address specific niche needs. In this post, we are going to review some of the best headphones you can choose for your transcription job. We are considering them in terms of output/performance, dependability/durability, ease of use, and the cost of acquisition. If you are looking for a headset that will virtually eliminate the existence of your immediate local surrounding, this is the piece you should go for. It has a comfortable cushion that sits on your ear very well and cancels noise from the immediate environment. This allows you to focus on your work without unnecessary distractions that will attract your attention and detract you from your work. As a result, you will realize increased productivity. We already mentioned the fact that this piece is comfortable to use on your ears. This will allow you to work on longer files without having to remove the piece every so often due to soreness on your pinna. Your mobility around the working station is not hindered by a short cable, as this headset comes with, wait for it… a whopping 10-foot connection cable. It is compatible with any computer that has a USB port. Noise cancelling ability makes it perfect for transcription. It is designed to detect the vocal range through a frequency detector. Reasonably long cable for enhanced mobility. Price-wise, it is a mid-priced high quality headset that will last long under good maintenance. If you try using this headphone for listening to music, you may end up throwing it away. It is designed to pick the vocal frequency and it may not give you the best quality f you are going to use it to listen to music. The length of the cable may be a little too much and may cause some problems if you have a cluttered desktop/workstation. Overall, this headphone takes the trophy considering output, durability, ergonomics, and cost. If you are a professional transcriber, I do not see the reason why you should not spare a few bucks on this amazing piece of technology. It will improve your productivity and reduce chances of ear damage. If you are looking for something light that will not compete for space over your head while still giving you reasonable quality, Spectra is what you should go for. It is slim, sturdy, lightweight, and beautifully designed. Spectra comes with smaller speakers and a flexible overhead/under-chin loop that is adjustable to give you a firm grip while working. It also comes with on-set media control for easy adjustment of volume, so you can pick up even the very low volumes in file. It has a 10-foot cable and a USB connection, so, you can use it on any computer that has a USB port. Small in size, suitable for people who are concerned with how they look while at work since it will not take too much space over your head. Easy media controls with the on-set control buttons that directly controls the volume of the computer. This makes it easy to capture the softest of speeches/interviews. Longer cable for easy mobility. It does not have one of the best ergonomics. You will feel some pain on your pinna after working with this headset for some time. The band is not adjustable and will slide off your head after sometime. Since it is designed for transcription, it is not suitable for listening to music. Longer cable can get messy if you are working in a crowded workstation. This is a good budget headphone for transcribers who love to travel. It sheds off additional weight off your package. As with every other thing, you have to compromise an aspect if you are looking for another strength. In this case, you trade size/weight for ergonomics and sound quality. If you are looking for the ultimate mobility at your workstation, this is the headset to go for. Perhaps you have a standing desk and take brief breaks every 20 or so minutes, this headphone will give you the freedom to move away from your desk while still connected to your computer and listening to music. Bose QuietComfort has a noise-cancelling capability making it possible to extract the best quality of sound from your media file. The speakers provide a rich sound feedback while the cushion makes them extremely ergonomic. They are adjustable to fit different head sizes and they are lightweight enough to avoid causing you unnecessary strain. They are not only well built but also foldable and come with a carrying case to increase their durability. They have the excellent sound quality typical of Bose products. You will never be disappointed. This is an all-purpose headphone that is not only suitable for transcription, but also listening to music and pretty much every other activity you would want to use your headphone for. They are wireless for increased mobility. With this headphone, you have the ultimate hands free experience. It is a huge headset that will give you the false impression that you are an aviator. They are bulky though not heavy as such. This headphone is for those who are looking for the ultimate versatility. Those who are transcribing now and the next moment they are mixing audio tracks. It is for those who do not like to be chained down to their desks the entire time they are working on a project. If you can afford this piece, we strongly advocate that you should definitely give it a try. It is unbelievably true, but you can get a phenomenal headset at less than 30 bucks. You definitely don’t have to sell your kidney to afford a good headphone for transcription because Sennheiser is here to rescue you. This headset is beautifully designed and well built for ergonomics and performance. They are good performers capable of blocking all the external noise, thanks to their signature padding. They are comfortable on the ear and offer a beautiful grip without adding unnecessary strain to the ear. It has a 10-foot connection cable for better (though limited) mobility at your workstation. This headset can be used for both transcription and listening to music. They have better ergonomics, which means you will work with them for longer periods without hurting yourself. You can use this headset for both transcription and listening to music without losing quality. It is lightweight and will not cause unnecessary strain to your neck. They huge and bulky (though lightweight) and will be competing for space over your head. May not produce the best output for difficult voices during transcription since they are not specifically designed to pick the vocal range. They are neither retractable nor foldable; you will have some problem carrying them when you are travelling. If you are tight on budget and you are looking for a versatile headset that will allow you to produce high quality transcripts without compromising on your health and yet still listen to some good music, get this beast. Everyone loves the hands free experience and the Anlo Bluetooth Wireless Earbuds offers just that experience. They are lightweight, well-built versatile headsets with an exceptional quality of sound output. Their wireless capability is comparable to none and they come with a microphone to boot. If you are looking for a lightweight headset that gives you the freedom to move around the office or home during break without detaching from your multimedia interface, you need to check this piece out. What is even amazing with these headsets is that you will find them at an affordable medium range prices. The quality of sound you get from this piece of technology is worth the sacrifice. High quality wireless headset ant an affordable price. Has a comfortable design that allows for wrapping around the ear for proper grip. You can even go for a jog around the neighborhood or use them at the gym. You can use this headset for listening to music without losing the quality of sound. You are going to be extremely careful with this headset lest it breaks down sooner than you expected. The design is not as solid as that of a full sized headset. Some users have reported wireless pairing problems with their pieces. There are chances that you could experience the same. Go for this piece if you are in love with the idea of wireless connectivity and you just don’t dig the idea of a full sized headset. You have to be one careful person if you are going to use them for long. You may need to lock them away if you are not using them because when they fall into the hands of a less careful person, that could be their end. Olympus is a simplistic headset that is optimized for the vocal frequency making it a transcriber’s best friend. It is lightweight and fits perfectly over the head and supply sufficient inward pressure to keep it pressed on the ear while you are working. It has better sound quality than most peers within its price range. It comes with a long cable for improved mobility. The jack pin has a firm grip reducing any chance of the device disconnecting unexpectedly. The firm grip also improved the quality of sound output. It has a volume boost that makes it easy to hear low volume interview subjects in an audio file you are working on. The sound is optimized for audio frequency making it suitable for transcription work. Additionally, this headset has a great output for music than most vocally optimized headsets. You will enjoy listening to music with this headphone. The long connection cable improves mobility. The 3.5mm jack pin has a very firm grip, which avoids loss in sound quality. It is lightweight, which eliminates any extra weight on your neck while you are working. The sound output, though has a boost, some of it will have a muffler effect. You may not pick up some sounds correctly. For instance, the ph sound may come our as s sound. There is some echo effect that you may not like. The buds that cover the speakers are not comfortable for long use. They heat up and the ear becomes very painful when you use it continuously for extended periods. Get this headset if you are working on shorter files that will allow you to take breaks every so often. If you totally don’t like “over the head” type of headsets, you will love Wordsmith. It is specifically designed for transcribers and comes with a USB connection. It has a soundcard that overrides the PC’s soundcard to produce better quality output. You have full media control pad on the cable, so you can reach it easily when you are working and adjust the sounds appropriately. A lot of thought process was invested in this piece of technology. You will notice that it has a ferrite bead that suppresses and cancels out frequency noises. It is also designed to pick the vocal frequency of sound making it a perfect investment for any serious transcriber who is concerned with the quality of his/her output. Specifically built for transcription and comes with its own soundcard and media controls to get better quality sound output. Light weight and will not weigh you down when you are working on a project. In fact, they are so small and the only space they will take on your head is in your ears. Comes with a 10-foot connection cable for improved limited mobility at your desk. A little bit more expensive than its peers are due to the incorporation of the ferrite choke. Smaller speakers may not provide a rich experience with low frequency sounds to your liking. It is designed for transcription and may not be the best headset for listening to music. This is the headset you need to buy if you do not like the idea of having a headphone over your head (literally). It is designed for transcription, hence will give you the best quality vical sound for superb transcripts. It picks quiet sounds quite efficiently and you will score highly with interview subjects who speak quietly. You may not like the “over the head” type of headsets but you still want a headphone that applies some inward pressure. Philips Speech Deluxe is what you should go for. It is designed to fall under the chin to keep an even pressure on the ears to avoid coming off while you are working. It comes with a 10-foot cable to allow for better mobility around your working station. The speakers are well built to provide better quality audio output that is a big contrast to their size. The device is lightweight and will not weigh you down while working on your audio transcript. · Comfortable on the ears and does not come off while you are working. It does not apply any pressure on the head (which also eliminates any chance of catching a migraine). Uses a pin connection, which means that it uses a resident sound card in the computer. If your computer’s sound card is not powerful, you will get crappy output. You may experience imbalanced sound on the ears. Sometimes, one ear will be completely silent. However, this problem is device dependent and may not be entirely apportioned to the headset. It is just a possibility and may affect you if your computer is a victim. They are good transcription headphones with good quality sound output for those who are looking for a lighter device. Get one if you have a superb sound card on your computer (almost all the latest models do). If you are looking for the “under the chin” headset with the ability to shift between mono/stereo modes, you should consider purchasing Lanier. It has powerful speakers for a richer sound quality. It is optimized for the vocal frequency making it a transcriber’s best companion for working on files that would otherwise be indiscernible. Comes with 55 inches long cable that has in-line media control buttons for easy manipulation of the audio file. It also has soft sponges on the earpieces to cushion the ear against excessive pressure on the ear. As a result, they are comfortable enough to use for transcribing longer audio files. This headset offers premium features that are absent on competitors. · They are lightweight and you can use them on longer files without feeling any weight. · They are comfortable and have a spongy cushion to protect the ear from injury or excessive pressure. · Optimized for vocal frequency and will make your work of transcribing difficult audio much easier. · You need to be careful with these headsets. If you strain the cable or drop them accidentally, they may develop an electrical fault and cease to operate. Get this headset if you are looking for a lightweight solution to transcribing longer audio files in a quiet environment. If you are a transcriber with a penchant for the medical profession, this headset should be able to quench your thirst of garroting a stethoscope around your neck. It is simplistic and well built to last while providing you with an awesome sound output. Medical transcriptionists will find this piece quite enticing because it gives you the feel of whatever you are transcribing. It comes with a right-angled jack pin connection for a firmer grip on the computer to avoid accidental disconnection while working. It also has a 10-foot cable for enhanced mobility at your workstation. easy compatibility with a computer. The earpieces have a soft sponge to cushion your ears against pressure that may lead to any injury. · Comes with a right-angled jack pin for maximum grip and increased protection to the cable. It makes the connector stronger and reduces the chances of the cables cutting under the insulation. · The wishbone connection style provides sufficient grip to the headphone while eliminating unnecessary pressure that may result into injury to the ear. · The media controls are easily accessible for improved usability. · Has a longer cord (10-foot) to improve mobility at your workstation. · It folds nicely and will give you easy time when packing for a trip. · The fact that it has a wishbone connection type means that you are not going to use it over your head. You may feel some level of discomfort when you take an occasional side-glance while working since it hangs under the chin. This is the headset to get if you are looking for small sized transcription headset you can go on a trip with. It is easy to pack in your bag due to its unique joint architecture. As you must have noticed, a transcriber needs a headphone that has proper sound quality, especially one that is designed for vocal sound frequency. The headset should also be able to cancel all the unnecessary background noises, both in the immediate environment and in the file setting. You are going to be using the headset A LOT. You need something that is not going to cause you unnecessary pain, as such will only slow you down and interfere with your productivity. Look for a headphone that is designed to be most comfortable. Pick a headphone that does not add unnecessary weight or pressure on your neck while you are working. If you have smaller ears, a huge headphone may be unnecessarily baggy on you and feel uncomfortable to use. Similarly, if you are blessed with larger ears, you are not going to be comfortable using smaller headphones. It is advisable that you choose comfort over preference. What you prefer may not be the very best or a healthy choice for you. You are in this for the long haul; you do not want to interfere with your hearing because you will be out in the streets pretty soon if you do. Choose a piece that allows you to go through your tasks without much fuss. The control buttons should be readily accessible when you need to adjust the volume of the file you are working on. On some headphones, you will have the ability to switch between mono and stereo sounds and even boost volumes. Such capabilities make a headset easy to use when the file you are working on has a technical problem that a mere increase in volume will not solve. There are USB headphones and Jack pin headsets. Each of these have their pros and cons. Jack pin connection type utilizes your computer’s resident sound card to manipulate the sound. This means that the quality of sound fully depends on your computer’s sound card. If your computer has a poor quality sound card, you may need to install other software like DFX to boost the quality. On the other hand, USB type headphones come with their sound cards, which bypass the computer’s sound card and manipulate the sound independently. This is a major plus if you are not tech savvy enough or you do not want to spend more cash on upgrading your computer’s sound card. Easy of making small movement around your working station (like when you are reaching out for coffee) is a necessity. Your headset should allow you to make these limited movements around your desk without much restraint. Shorter cables will be pulled off when you try to stretch your body or when you lean back on your seat. However, too long a cable can make your life pretty difficult since it will entangle everything that comes its way. The entanglement will lead to intertwining, which will lead to cutting of the cables rendering your pricey device useless after a short period of use. e) What is your Budget? Many people tend to overlook the simple fact that your budget matter. When you are going to purchase the best headphone for transcription, you are working with a budget because you are investing on an asset the will bring you returns over the next several months or years. It does not make economic sense to spend hundreds of thousands on a gadget that you are going to use on projects that are worth hundreds or a few thousands. Choose a budget to work with then go shopping for a device that falls within your budget range. Working with a budget will save you a lot of headache and time when you go out to shop. You can use your budget and then check out from among this list, which transcription headphone best suits your current needs. That is what you should buy. At 1 Helluva Review, you always get more than just what you came for. That is why we are giving you access to this bonus video that will help you speed up your transcription speed. We believe that this list will help you make an informed choice for the best headphone for transcription. When you finally acquire your piece, we would be glad if you shared with us your experience in the comments. 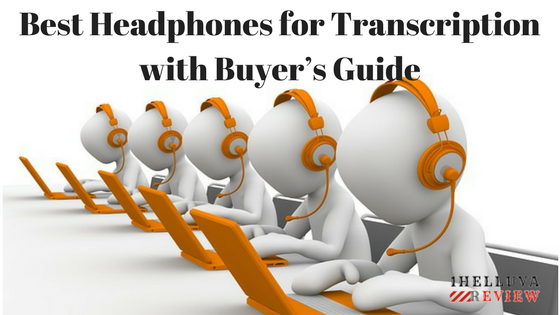 Which headset do you use for your transcription work? Please let us know in the comments.